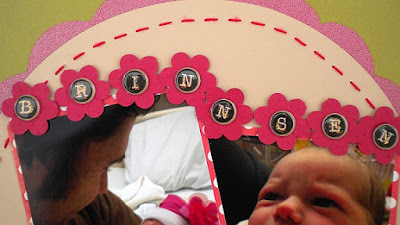 Today I wanted to share with you a scrapbook page I created of my darling little grand-daughters birth day. I adore the way her little face is all scrunched up in the photos as she gazing up to her daddy's face in such consternation! 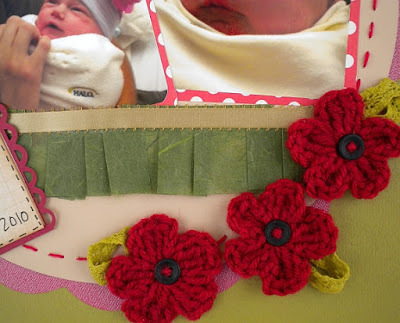 The page layout was inspired because of a challenge going on at Paper Patch Crafts that requires the use of the colors red, tan and olive green and a touch of lace or ribbon. Please join in on the challenge. It is going on through the 16th of this month. There are always prizes going on over there for challenges, so please join Paper Patch Craft's facebook page if you haven't already. Tell Anne that Shelley T sent you. (Another design team member is Shelley P and we are always confused who is who! :) ) I wanted to mention that I think I must be the last person in the United States that wasn't aware how handy Walgreen's Photo Center is when it comes to having your digital images made into photos. I uploaded a few photos to the store that is only 1 block from my home and had them in my hand within an hour! What a great world this is! I give up on faulty printing with my home printer and expensive ink cartridges. This was so easy..and inexpensive! The red scalloped circle paper has a sheen to it that makes the paper look pinkish in the photo. I am always so disappointed when my lack of photography skills doesn't do credit to the way something looks. I made the scallop using my cricut and the Forever Young cart. The circle was cut with Plantin Schoolbook. I used my cool Sew Easy for the stitching I did around the circle. I lifted the idea of the alpha buttons from my friend Anne's video tutorial over at her blog. I wanted to add some green ribbon for embellishment but didn't have the right color or width for what I needed so improvised by using mulberry paper to make the pleated ribbon. I really liked the effect it gave. I finished off my project with a few of the cute little crochet flowers I made. I hot glued a little green crochet trim to resemble leaves for my flowers. A tutorial on how to make these yourself is below. I hope you enjoy this project! Shelley Toney! I remember about 40 years ago I learn how to do this a little different (I think lol). Wow! I TOO LOVE IT!!! Looks great. Those flowers are adorable! I almost didn't even recognize her at first. She's changed so much in 8 months.